Each year CAMRA organises championship rounds to determine the best Pub of the Year. The rounds start with voting by branches for their nominations in each county they represent and these then go head to head with those pubs submitted by other CAMRA branches within that same county. These then go onto the regional finalists for West Midlands and then to the final Pub of the Year for the UK. The Shakespeare Branch of CAMRA awards pubs the title of Branch Pub of the Year - one for Warwickshire and one for the Worcestershire branch areas. 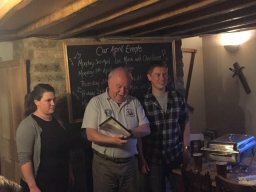 Shakespeare CAMRA Pub of the Year (Warwickshire) 2017 has been awarded to The Turks Head Alcester. The Turks Head was converted back to a pub in 1999 after many years as Turks Head Antiques. With bare wooden floors, old furniture, wattle n daub walls and a brick chimney breast they have all combined to give this 17th century town house a rustic atmosphere which is further complimented an adventurous range of meals and bar snacks featuring locally sourced ingredients. During the presentation Lloyd explained that he first had contact with Carl when the branch started to receive emails asking why the Turks had not yet appeared in the GBG and we in turn tried to explain the process involved in the selection process. However, in 2013 the branch decided that on merit it should receive this due recognition and we are pleased to say that it has appeared in every edition since which is quite an achievement in the ever changing brewing and pubs industry Throughout this period the quality and range of beers on offer through the four hand pumps has been excellent and Lloyd made reference that on a personal note he only had one complaint and that is the Butty Bach sells so quickly he always seem to miss out on drinking it. Further to this the Wye Valley HPA, which is regularly available in the Holly Bush, is considered by many in the branch as being consistently the best served beer in our area. 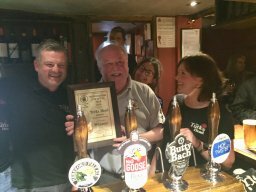 Shakespeare CAMRA Pub of the Year (Worcestershire) 2018 has been awarded to the Fleece Inn Bretforton. In recommending the Fleece for POTY award our members firstly acknowledged that this is one of Britain’s best Real heritage pubs which we are very fortunate in having within the CAMRA Shakespeare Branch area. Having started life as a farmhouse, originally built in the early 15th century by a farmer named Byrd, the pub remained in the ownership of the same family until 1977 when the last of the descendants a Miss Lola Taplin bequeathed the pub to the National Trust when she passed away in front of the fire in the snug. As a branch we are pleased to say that it has remained largely unchanged, although it now serves delicious pub grub and most famously pays homage to the locally grown vegetable Asparagus during May and June. Nigel Smith has been the landlord of this famous pub since 2002 although in 2004 (27th feb.) the Fleece itself nearly passed into history when a spark from a chimney set fire to its thatch and aged timbers. Such was the help from the local community that many of the precious antiques, including the world renowned pewter collection, were rescued and are still on display today around the pub. 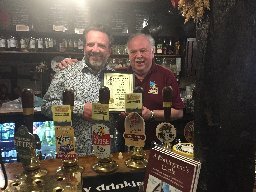 Recognition of the quality and choice of real ale offered at the Fleece is however the main reason that we made this award and with two regular beers in Wye Valley Bitter and Uley Pigs Ear and three guests there is usually at least one beer which would suit everyone’s taste. In making the presentation Lloyd offered his personal appreciation for serving two of his favourite beers during the winter months in Uley Pigor Mortis and Marston’s Owd Roger and extended his thanks to Julian, one of the main bar staff at the Fleece, for being kind enough to have told him as to when these beers were being served. We therefore had great delight in asking Nigel to accept the POTY award on behalf of everyone at the pub with all our best wishes for the next round of judging for the Worcestershire County POTY. The Norman Knight, Whichford this year has obtained the prestigious award of Warwickshire branch Pub of the Year. The Norman Knight is owned by our one of our newest branch breweries The Stratford Brewery and is always a good place to sample their beers. It is run by Amber and a dedicated team who do a great job of keeping the ale in tip top condition. 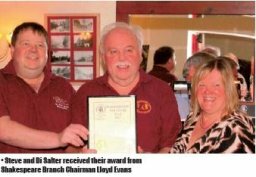 The pub has good history of being a CAMRA award winning venue and meets this high accolade having achieved this twice before and winning CAMRA West Midlands regional pub of the year in 2006 under different ownership. It has recently undergone some sympathetic updating and introduced glamping pods to its small campsite. You will also find great food here and many groups choosing it as a meeting place especially during the summer months with a vintage car evening. Presentation on 26th April 2017. The Coach and Horses, Harvington were this year awarded the Shakespeare Branch Worcestershire Pub of the Year - again. This is the fourth year running that Steve and Di have received this award. The quality of their ale is outstanding and they always have four rotating beers available with a mixture of local and national beers which are extremely well kept. The Coach and Horses is approaching a milestone and will have been a pub for 300 years in 2018. To celebrate Steve and Di plan to offer 300 different ales throughout 2018 and we look forward to trying as many as possible! Presentation on 4th April 2017.